You may remember that in 1999 a specialist doing prenatal surgery on a baby at Vanderbilt University Hospital was astonished when the child reached out of the womb and wrap its tiny hand around his finger. We ran a story and follow up in our AFA Journal about Baby Samuel. A later update can be found here on the Free Republic website. Perhaps inspired by this true story, the Fox network's drama "House M.D." contained a similar scene in this week's episode. In it, a 42-year-old woman 21 weeks into her pregnancy faces a life-threatening emergency. When tests indicate that the baby is the problem, Dr. House decides to terminate the pregnancy. However, the mother will not consent to the abortion, and so the decision is made to perform a prenatal, open womb surgery on the baby in effort to save both mother and child. During the surgery, the baby reaches out his tiny hand and stroke's the doctor's hand. The show's synopsis describes the scene this way: "When House cuts into the uterus, the fetus's arm emerges, tenderly grabbing House's finger. House freezes, staring at the tiny hand in awe. Despite his earlier insistence that this is a fetus and not a baby, he seems moved by the moment." 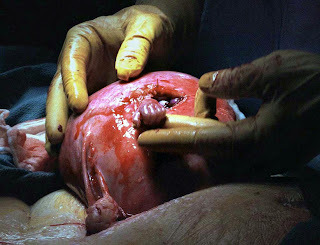 The picture was taken by freelance photographer Michael Clancy, the famous picture taken during the en-utero surgery to treat spina bifida in a preborn patient at 21 weeks of gestation. The child who was the patient in this surgery, Samuel Armas, is now seven years old. You may see a brief video clip of the scene at this link. Hi Buddy, It was also after that scene that House no longer referred to the baby as an "it" or a "tumor" but as a BABY!